A bathroom is one of the hardest working rooms in the home, so it’s essential that it can meet the demands of daily life. Whether you are refreshing an old, tired bathroom or building a new one, Rubix Kitchens can help you with your next bathroom project to make sure it ticks all the boxes. We will work closely with you to make sure it has the right balance of design and functionality, as well as quality materials and fixtures that will stand up to the test of day-to-day use. From a large family bathroom to a small ensuite or powder room, we can offer you a solution that suits your needs, style and of course, your budget. We also specialise in laundries, another hard worker in your home and equally important to get right. From initial design planning through to a working, functional laundry or bathroom space, Rubix Kitchens can provide you with a superior service and quality products to make your next renovation or build easier – and long lasting. If you’re in need of some ideas, visit our showroom and have a look at our vanity and laundry displays or have a chat with our helpful staff. With a wide range of products and selections available, the team at Rubix Kitchens can assist you with any questions you may have. Like what you see and ready to move forward? Book an obligation-free consultation with our qualified designer to discuss your requirements and start planning your new space. You’ll need to bring with you the dimensions of the current space (including a rough floor plan), and a few pictures of the space so we can get an idea of what it’s like. Rubix Kitchens will help you as much as you need on your next bathroom or laundry project. 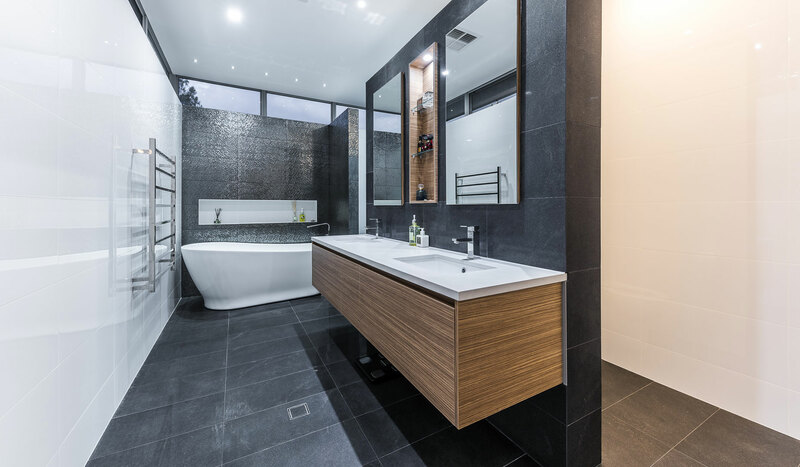 We can simply arrange the cabinetry and bench top side of things, or project manage the complete job including tiling, plumbing and electrical work. We can also offer you a range of quality and affordable taps, troughs and basins to complete your new space, and take the stress out of shopping around.